The Jet Towel™ is finding use in a wide variety of facilities where a high level of hygiene is critical, including food-processing plants, hotels, supermarkets and all types of business facilities. Its cost-effective operation and environmentally friendly design afford operators and users alike with a number of distinct advantages. Nothing to refill or replace and no waste paper to pile up or dispose. The Jet Towel™ will always give a clean and professional feel to your washroom. With antimicrobial treated surfaces for added hygiene and alcohol-resistant resin for easy cleaning, the Jet Towel™ has been designed for ultimate hygiene and cleanliness. Featuring the most advanced "dual-jet" technology, the Jet Towel™ was first developed in 1993 by engineers from Mitsubishi Electric. Dual jet technology produces powerful air currents (382 kmph) to literally wipe the water off both sides of the hands. The result is completely dry hands in just 10 seconds. With over a 90% reduction in energy, the Jet Towel™ hand dryer is the most energy efficient electric high speed hand dryer on the market. Consuming only 550W, compared to 2400W used by conventional hand dryers, the Jet Towel™ can effectively save money, power and reduce your carbon footprint. Operating at a low 58dB (61dB in high speed mode), the new hyper-nozzles combined with advanced jet stream control technology has rendered the Jet Towel™ the quietest high-speed hand dryer on the market. Equipped with adjustable air speeds, the noise level can be reduced even further. 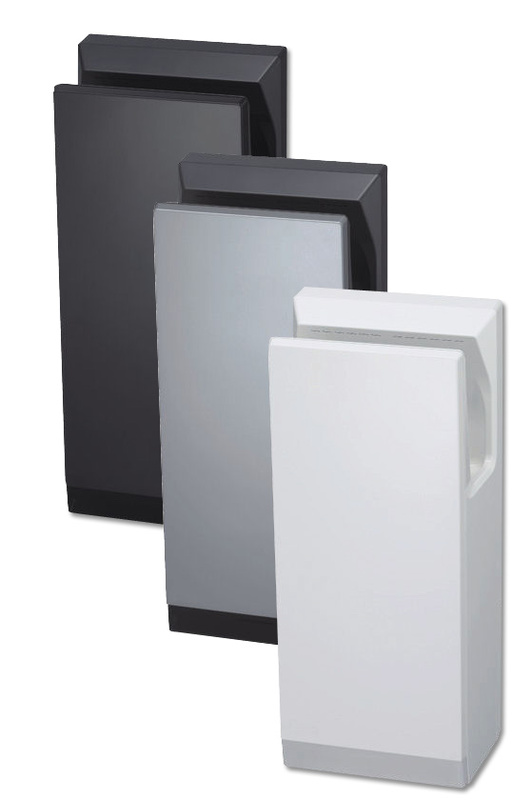 A slim design blends form and function, with the front panel angled gently outward to allow the user to stand comfortably and naturally when inserting hands into the Jet Towel™. Now in its 8th Generation and with over 20 years experience in high speed hand drying, you can expect the highest quality, most effective, cost efficient and hygienic hand drying solution from the Mitsubishi Electric Jet Towel™.